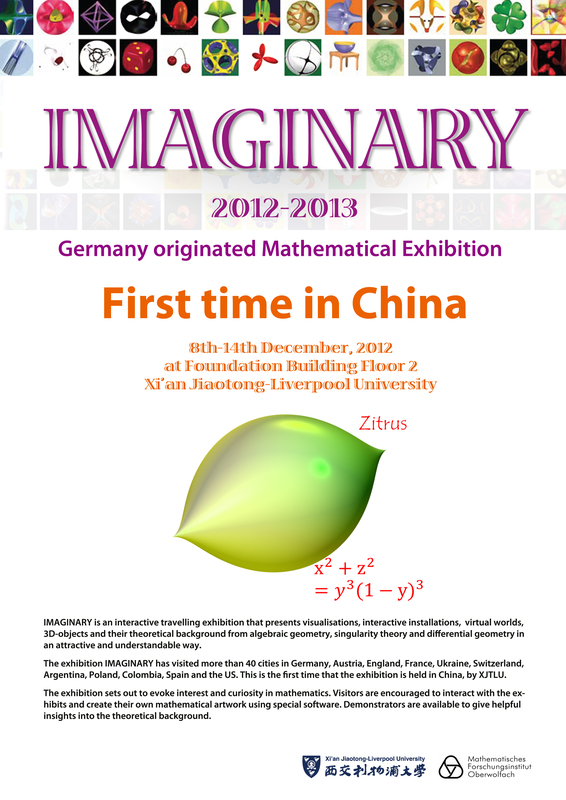 The first IMAGINARY exhibition in China is organized by Xi’an Jiaotong Liverpool University (XJTLU). The exhibition includes 12 algebraic 3-D sculptures, 49 geometric images with English and Chinese explanations, 5 main interactive programs (Surfer, Cinderella, Morenament, 3DExplorer and Curved spaces), animations, slide shows and a catalogue with bilingual explanations. In the evening various movies on mathematics are shown. Distinguished guests at the opening are: Prof. Qun Lin, a senior academician from Chinese Academy of Sciences; Prof. Jingliang Yue, a National Educational Master from Shanghai Jiaotong University; Prof. Zhoutian Fan and Prof. Hanlin Zhang from Beijing Industrial University; other professors from Tongji University, Suzhou University and Xi’an Jiaotong Liverpool University.